Recently updated packaging has seen Deep River keep their traditional logo, while also retaining their star-burst color contrast and the graphic kettle and sliced potato. What they have changed is the main bag color - each different flavor has a bold and striking color packet which will stand out on the shelves. The Red is particular noticeable, but as the starburst radiates from the graphic, the image should probably have been a little less cartoon basic. These Chips were just the right thickness to get a superior crunch. Not too hard or brittle. There was nothing soft about them. There was not a lot of oil about, despite the Kettle Cooked nature of these Chips. They were generally irregularly shaped with some darker seasoning powder, but the residue left on fingers was not nearly as much as seen with many. 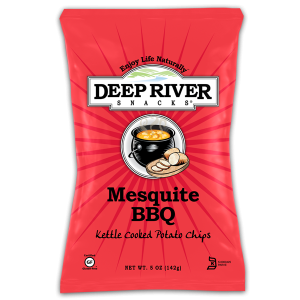 These Chips had a really pleasant Mesquite flavor mixed with a generally warm barbecue taste. It was not nearly as strong as some, or indeed as strong as it should be. A relatively mild, sweet and tangy experience.